I’ve been teaching art at a program for adults with disabilities for over a year now, and during that time was lucky enough to meet Metrius Englin, an artist I deeply admire. She is now attending the fabulous NIAD (National Institute for Art and Disability) in Richmond and has recently had her work and approach highlighted on their website blog. Her work is available online and you can also take a look at the work of other NIAD artists by visiting the gallery at NIAD, open Monday to Friday 10 – 5pm, 551 23rd Street, Richmond, CA 94804. Telephone (510) 620-0290, niad.org. 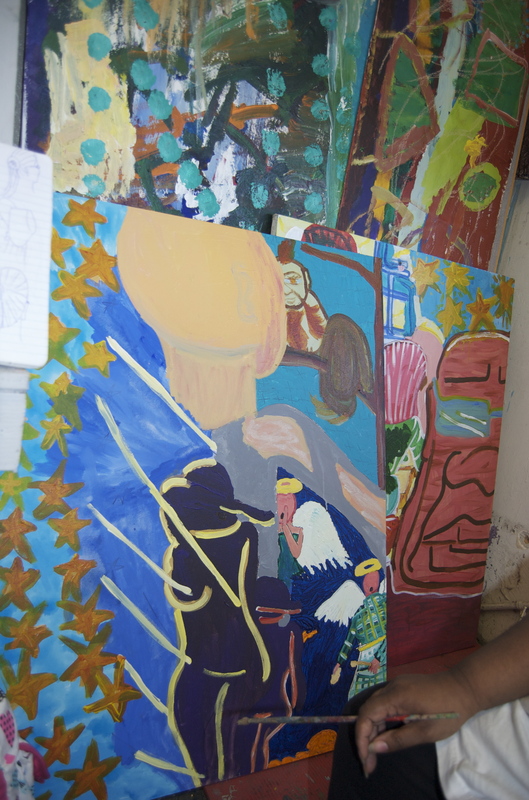 Below is one of her paintings in progress, from the last time I visited the studio at NIAD, full of color and passion. This entry was posted in Uncategorized and tagged NIAD, painting, Richmond. Bookmark the permalink.